Recent defeat of an Italian referendum which was supposed to replace ultra-restrictive IVF legislation is interpreted as a great victory for Catholic Church. And it is even greater victory for Benedict XVI who showed that his clout expanded even beyond the walls of Vatican City. Just as he was underestimated in the conclave, he was underestimated in his ability to influence politics in nominally secular country like Italy. There are already speculations that Benedict’s successful campaign against the referendum represents only a test for even more ambitious attempts to push Catholic agenda in Italian legislation. Some commentators believe that in very short time abortion and divorce might become thing of a past in Italy. Many tend to disregards those warnings as pure sensationalism and panic. On one hand, it is quite inconceivable to imagine Italy becoming a de-secularised in the 21st Century, especially in times when church attendance continues to fall and Church begins to look more like a tourist attraction than an important factor in everyday life of an average Italian. But there is one factor few people, except Benedict XVI, took into account. Reasons why Italians don’t attend Church nor follow Church doctrine have very little to do with ideology or religious convictions. The more simple explanation for the decline of Church is in devout Catholic lifestyle becoming unattractive, bothersome and inconvenient for increasing number of Europeans. In other words, there are fewer and fewer young Italians who would stay at home on Saturday evening only to attend Sunday mass. Benedict XVI reasoned that most of those who don’t bother to walk to the nearest Church aren’t likely to walk to nearest polling booth either. The very same hedonism and prosperity that drove the Church away from average people in Western Europe is going to prevent those same people from fighting for the secular nature of their countries. Referendum was easy to defeat – all Church had to do was to call people not to go the polls and thus deprive it of necessary 50 % turnout. And people, whether they agreed with Church positions or not, listened to that call. By doing that, they established the precedent that could do to European secularism what fall of Berlin wall did to European Communism. It is definitely too early to make some general impression about papacy of Benedict XVI, but it seems certain that he is going to be less popular than his predecessor John Paul II. The reason for that may be other than Ratzinger’s lack of charisma, German background or ultra-conservative policies. If Benedict XVI is serious about cleaning the “filth” in the Church, his work is going to break too many hearts and shatter too many illusions. And if he is not, the unfriendly world media is going to do the same. What awaits Benedict XVI could be seen in the latest Church-related scandal to erupt in Croatia. Alojzije Stepinac orphanage is run by Caritas, Catholic charity, and situated in Brezovica, near Zagreb. In 2002 activists of Hrabri telefon, NGO, received a complaint about massive and systematic verbal, physical and sexual abuse of children. They contacted police as well as Ministry of Labour and Welfare. The latter conducted inspection and found claims about abuse to be correct. However, the Ministry at the time was run by Davorko Vidović (Davorko Vidovic), prominent member of ex-Communist SDP party. Vidović decided to put the inspection findings in archive and do nothing about it. The media learned about this and confronted Vidović. His reply was as honest as depressing. “If I did something or closed down the orphanage, they would have crucified me as evil Commie suppressing the Church”. Vidović’s arguments were apparently adopted by Mladen Bajić (Mladen Bajic), Chief Prosecutor of Croatia. According to him, Municipal Attorney Office never received “proper criminal complaint” and now nobody could prosecute for those wrongdoings in orphanage because of “legal time limitations”. Jelena Brajša (Jelena Brajsa), director of orphanage, claims that there were some “sexual situations” in orphanage, but they were “normal”, just as the beatings of “undisciplined children” are “normal part of educational process”. She, however, adamantly refuses that any child was sexually abused by her staff. Vjesnik reports another reason why Vidović’s Ministry failed to do anything in 2002. Nino Žganec (Nino Zganec), state secretary for welfare in Health Ministry, used to serve as Vidović’s assistant. He was married to Jelena Brajša’s niece. The last person to enter controversy is Cardinal Josip Bozanić (Josip Bozanic), top Church official in Croatia whose relative youth and mild criticism of Tudjman’s government brought reputation of a liberal or moderate, at least among those Croatians who try to reconcile leftist and liberal philosophy with their personal Catholicism. This reputation is going to be much harder to maintain today. According to Jutarnji list, Bozanić consulted Croatian bishops and decided to back Brajša. 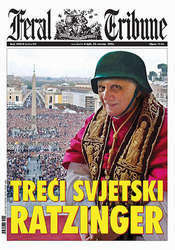 Zagreb daily reports that Church official believe the scandal erupted because “anti-Catholic media” wanted something bad to report in order to compensate for the Church-friendly coverage of John Paul II in his last days. Jelena Brajša at her press conference, shielded by Church and Caritas officials, expressed defiance and said that “State had nothing to inspect in Catholic orphanages”. According to her, “inspecting Catholic orphanages is the same as state officials censoring Mass”. This is the cover page of Feral Tribune. It was quite expected. I guess they finally found replacement for Tudjman – their favourite target whose death had marked the beginning of Feral decline. I was right. Short work by Ratzinger's conservatives. At least, there will be very little surprises coming from Vatican. He is elected faster than anyone has expected. My guess is that it was a short work – either by Ratzinger's conservatives or those who can't stand him. In any case, we'll see in couple of minutes. Pope-related media hysteria has reached annoying levels in Croatia. Two major dailies, trying to make a quick buck on the phenomenon, have offered their own Pope-related books at discount prices – although the “discount” price in those particular case happens to be 25 % higher than Tolkien’s Lord of the Rings. Others, like Globus weekly, gave pink rosary as a free gift to any reader – apparently unconcerned about what their Jewish, Muslim, Protestant or agnostic readers may think about it. In the meantime, it could be noticed that there are somewhat less Pope-worshipping stories in Croatian media, but the generally hagiographic attitude towards the late Pope is being switched to the next one. Almost any relevant commentator in Croatia expects Karol Wojtyla’s successor to be force of positive change. Even those belonging to Croatian liberal left have succumbed to this optimistic disease. Although few expect Catholic Church to wed gay couples, abolish celibacy, endorse contraception and abortion or have female bishops at the end of next pope’s pontificate, many believe that the next Pope will steer Church in that direction because Church, “like any other institution, must adapt to modernity”. This isn’t surprising since most Croatian leftists, at least those belonging to “European” mainstream, always had soft spot for Pope. They were quite comfortable with criticising Church stances on many issues and Church policies while praising Pope at the same time. In that way they weren’t different from die-hard Communists in Stalin’s gulags, who had never dared to think that the infallible leader at the top could bear any responsibility for sufferings inflicted by his “corrupt” subordinates. However, such optimistic appraisal of papal future is product of wishful thinking. According to my understanding, it is all but certain that the next pope is going to be a conservative. And it is very likely that he is going to be more conservative than John Paul II. The reasons for that are very simple. John Paul II was – and even his tireless worshippers admit it – a very conservative in most social issues. He made sure that those views are shared by those cardinals who are going to elect his successor. And the conclave is going to have three options. They could return to old ways and elect safe, predictable and utterly faceless Italian bureaucrat. This option might leave some hope for those expecting a liberal pope, because new pontiff might “grow in office”. But it is unlikely that the conclave will settle for that, because it would be perceived as a step backward for Church. Another option could be described as adaptation to new realities, although not those referenced by those who wish for a liberal pope. In other words, Church is going to pay more attention to demographic trends that favour Third World, namely Latin America, over industrialised nations where the number of Catholics is dwindling in proportion with their acceptance of “modernity”. So, if the next pope comes from Latin America, he will undoubtedly be conservative. Third option, which could, in a way, express continuity with John Paul II, is the election of a pope from the regions where Catholicism borders other vital and blooming religions, namely Islam. So, Arinze looks like a very good candidate. Black pope from Nigeria would not only symbolise faithfulness to late Pope’s ecumenical policies, but it could also silence, at least temporarily, all those leftist and liberals from industrialised countries who are critical towards Church. It would take a least a few years before anyone dares to say any critical word about new Pope, despite that Pope being more conservative and traditionalist than anyone dared to imagine. In my humble opinion, third option – whether embodied in Arinze or someone like him – is most likely outcome of the conclave. I've decided not to have a post titled "RIP John Paul II (1920-2005)" because it is pointless. Everybody knows that Pope died and everyone who has read this blog regularly probably knows that I disagreed with the late pontiff on many issues. That doesn't mean that I'm not saddened by his death and unmoved by the global eruption of emotions created by that event. But I'm also worried that the global bereavement will, at least in short term, create an atmosphere in which any kind of legitimate criticism of late Pope and his policies is going to be discouraged. Or, which is even more dangerous, it could create false sense of world being much nicer place than it really is. Some Croatians who believed in that had rude awakening in Skopje, Macedonia this afternoon. RK Zagreb, Croatian handball team, was playing European Cup Winners' Cup semi-final game against home side of Vardar. The game was aired by Croatian state television. Home side's fans, of course, couldn't resist the opportunity given by minute of silence and they booed at the mention of Pope's name. So, late Pope might have really strived for peace and multi-cultural coexistence, but he nevertheless left a lot of work to be done. Some Croatian bloggers are already having entries titled "RIP John Paul II (1920 – 2005)". I won't have such blog entry, at least not yet, but I nevertheless think that this is appropriate time to say at least one good thing about Roman pontiff. In Autumn 1994 he visited Croatia, at the time still at war and partially occupied by Serb paramilitaries. That didn't prevent him from creating the largest public gathering in history of Croatia. It is estimated that a million people gathered in Zagreb to listen his speech. During that speech he called for coexistence and brotherhood between Serbian and Croatian people and preached forgiveness. Of course, Croatians, just like many people in such situations, didn't listen. But John Paul II can never be overpraised for the effort. Today’s instalment of Nedjeljom u 2, talk show on HRT, represented 60 minutes that should enter into future textbooks of Croatian television history. Yet those 60 minutes were incredibly entertaining and profoundly disturbing at the same time. In past few years Aleksandar Stanković (Aleksandar Stankovic), show’s host, developed quite a reputation for his hostile but also a very effective treatment of his guests. But this reputation was slightly downgraded in past months when some of the guests, apparently after reading his act, came to the show well-prepared and gave him a good intellectual drubbing. But not today. This time Stanković was confident that would make a short work of his guest, but what occurred today exceeded everyone’s expectations. The guest was Professor Dr. Damir Buković (Damir Bukovic), one of Croatia’s leading gynaecologists and oncology experts. He was the most outspoken in the group of Catholic physicians warning the women of cancer risks that multiply with in vitro fertilisation. Buković isn’t exactly the unknown name in Croatia. His finest hour was in 1997 when he was elected for Zagreb City Council on HSS ticket. That party was part of anti-Tudjman opposition coalition which had unsuccessfully tried to have its mayor in Zagreb after winning city elections in October 1995. Tudjman, using his presidential prerogatives, repeatedly refused to confirm any of opposition candidates elected for mayor. In 1997 HDZ was two council seats short of majority that would end this embarrassing situation. Buković was one two HSS councilmen who defected from opposition and voted for Tudjman’s favourite Marina Matulović-Dropulović (Marina Matulovic-Dropulic). Although he got his reward in the form of prestigious hospital administration post, Buković remained out of public spotlight until re-emerging as anti-IVF crusader. During the show Buković, at least initially, tried to present himself as passionate defender of Catholic values in Croatian medicine. For him “the Bible is the best source of all medical knowledge”. After he continued to explain that not only IVF, but sexual promiscuity also contributes to the spread of cancer among women. He also followed the official Church line on condoms – they aren’t “100% safe” and are, consequently, worthless both as contraceptive and as a prophylactic. His views on masturbation are somewhat less radical – while it is “harmless among men”, it can create some health problems among women, although not “as severe as cancer and promiscuity”. This sort of ultra-conservative mindset isn’t uncommon in Croatia, even among people who are viewed as intellectuals. Therefore, those views weren’t some kind of earth-shattering revelation – in Tudjman’s Croatia they were all but state-sanctioned social policy. However, those ultra-conservative views are somewhat difficult to connect with certain details of Buković’s biography. During the show it was revealed that he had been remarried and when asked about, he said that he didn’t think of his second marriage (without previous being Church-annulled) as anything contrary to his religious beliefs. It was also revealed that he was not only a Party member during the good old days – which was, again, incompatible with Catholicism – but actually a Party secretary in charge of all Party members in one of Zagreb’s hospital. During the show he took great pride in the fact that he had personally shut down Party organisation in 1990, after the first democratic elections, apparently unaware how the viewers might interpret his last-minute conversion. He also used the show as the opportunity to boast about being well-off in the old system and owning a sports car at the very beginning of his career. The only trace of regret was in his admission that he had performed abortions. It was very entertaining to watch those all those confessions, especially when it became apparent that Buković was blissfully unaware about ruining his reputation with each sentence coming from his mouth. But such catastrophic (self)destruction on national airwaves was accompanied with a sense of horror, at least among those who saw Buković in the broader context of modern Croatia. What looks like an entertaining aberration on television is the standard way of thinking in most of Croatian offices. It seems that the controversial law banning shops from working on Sundays was just a test for Catholic Church. Apparent failure of the law – it was struck down by Constitutional Court few months after being passed in Sabor – didn’t discourage Church officials from pushing for even more ambitious legislation. Few weeks ago Church officials in Croatia open the first salvo in their PR campaign by issuing an official statement condemning the practice of in vitro fertilisation. Soon afterwards, group of Croatian doctors calling themselves Asociation of Catholic Physicians stated that the children conceived that way were more likely to be deformed and women who subject themselves to such procedure would have 1900 % more risk of developing cancer. Soon after that it was discovered that one of the brochures endorsing such views referred to children conceived in vitro as “things” instead of human beings. Under normal circumstances, this kind of discourse would have created full-blown culture war in Croatia. Feminist groups, NGOs, liberal section of Croatian media and scientific establishment did react, but public in general didn’t pay much of an attention, being engrossed in series of other scandals that just happen to erupt in these times. Needless to say, when Church starts talking this talk, many people in Croatian political establishment are walking the appropriate walk. In March, National Bio-ethics Commission, expert body which helps government in creating medical legislation, is about to vote on the recommendation for new laws covering in vitro fertilisation and similar issues. The present legislation covering that area dates from 1978, when Croatia used to be under Communism. Sanader’s government has agreed to make new legislation and even agreed on proposed bill to be sent to Sabor, but Sanader, apparently after some “friendly persuasion” from Men in Black, decided to make additional changes after consulting with National Bio-ethics Commission. According to statements by Commission member, dr. Ante Ćorušić (Ante Corusic), majority within the Commission is most likely to recommend radical change in current in vitro practices. Donation of sperm, eggs and embryos is going to be banned. Only couples who are married or live in “extramarital unions recognised by court” – the latter would include only heterosexuals – will be allowed to have in vitro procedures. So, if Ćorušić has his way, lesbians, single women or straight couples when one of spouses is completely sterile will not have any legal chance of having children. Ćorušić has not only government’s support – more tacit than in previous time, though – but even some arguments on his side. For a long time, Croatian liberals in their struggle with conservative used very simple mantra – any socially conservative legislation is un-European and would, consequently, block Croatia from entering EU. Ćorušić is now in position to counter this argument very easily. In neighbouring Italy Berlusconi’s government has recently passed equally restrictive legislation. This new legislation is very likely to pass for two reasons. Sanader needs Church in order to mobilise rural and conservative voters for the local elections. If they stay at home or – which is even more dangerous – vote on their local and tribal interests rather than on party line, HDZ is going to suffer embarrassing defeat. If EU doesn’t start accession negotiations in March, embarrassment will turn into catastrophe. Sanader is going to secure the passage of legislation with a same way he secured his HDZ chairmanship – by presenting himself as a moderate and liberal alternative to something much worse. The proposed changes are likely to more radical than those which are ultimately going to be passed in Sabor. That would allow HDZ to look as “serious”, “moderate” and “European” party that listens to the voice of liberal public. One such manoeuvre is already happening. Zvonimir Šeparović (Zvonimir Separovic), Commission vice-chairman, legal scholar and former Tudjman’s foreign minister (and failed candidate on 2000 elections) gave statement to Slobodna Dalmacija hinting that the changes would include what amounts to Holy Grail for Croatian conservatives – ban on abortion. Šeparović wasn’t that radical – after saying that for him the life started for conception, he stated that the present law was “too liberal” and that some restrictions should be “considered”. Andrija Hebrang, former health minister and champion of Tudjmanist hard-line right within HDZ, quickly reacted (and surprised many) by voicing his strong opposition to the ban. This was very good thing for Sanader – as former Sanader loyalist, Hebrang is likely to present “gentler and kinder” face to Croatian liberals; as someone who had to leave his post for health reasons, Hebrang doesn’t have enough clout to seriously offend Sanader’s conservative allies. Therefore, it is unlikely that abortion will be banned, at least not this time. But the path has been cleared for a disturbing scenario of Croatian future in which society would favour unwanted over wanted children. And, just like in Space: Above and Beyond, children brought to this world in “improper” way are going to be referred as “things”, “non-humans” and discriminated. Or worse.